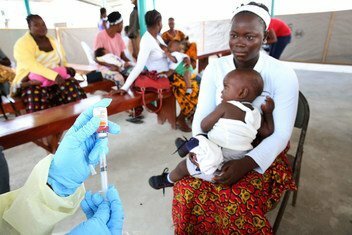 Noting a 300 per cent surge in the number of measles cases during the first three months of this year, compared to the same period last year, two UN agency heads declared on Monday that we now stand “in the middle of a global measles crisis”. 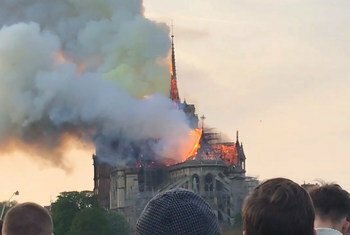 Top news on Monday includes: UN chief expresses his horror over the huge blaze in Notre Dame; a deal over Hudaydah troop withdrawal beckons, but war intensifies; “global measles crisis” underway. A projected near-doubling of measles infections has been identified amid rising severe and protracted outbreaks all over the planet, in poor and rich countries alike, the World Health Organization (WHO) said on Thursday. Listen to our daily bulletin of news and features from the United Nations, presented by Matt Wells. Annual deaths from measles dropped below 100,000 last year for the first time, to 90,000, United Nations and other international agencies reported on Thursday, as they warned however that the world is still far from reaching goals on eliminating the disease. Parents in north-west Syria now have access to more than 35 re-opened vaccination centres where they can bring their children for life-saving protection, the UN said on Friday.